When I am able to get a substantial harvest of snow peas from the garden (enough to feed three, at least) I always cook them the same way. 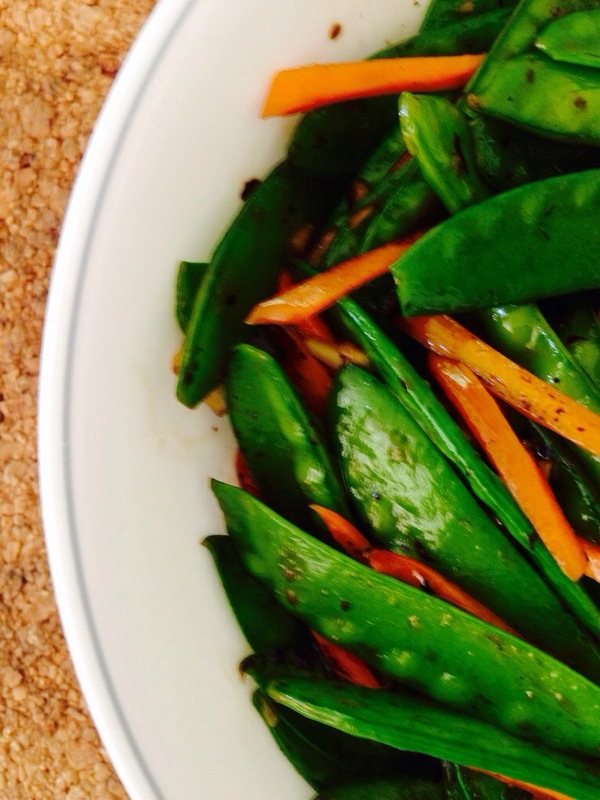 This is my snow pea stir fry, and it is just as simple as it is delicious. Something I must insist on in cooking this dish properly is the use of a wok or a heavy based frying pan. Don’t even think about using any non stick cookware because you can’t (and shouldn’t) reach the temperatures required for that lovely seared smell to be created. Many people swear by frying the aromatics first for maximum flavour – and if you do too – I recommend you turn the heat down to low before you add the oil and garlic. It’s such a delicate ingredient that the moment it hits the searing hot oil, it will start to burn and taste bitter. The only ‘bad’ thing is that by turning the heat low you also forfeit the nice, searing heat required for that delicious wok smell (wok hay) that permeates the entire dish. Oh and excuse the slightly blurry photo!! – Heat up the wok on a high flame. It will be ready when it feels like it’s radiating a lot of heat from the centre when you place your open palm a few centimeters from the surface. If it is a used wok, it will probably start to smoke because of the residual oil left in from previous cooking – that’s normal. – Throw in the carrots and toss them around. They will begin to sear immediately, and this is when you need to add the garlic. The carrots cool the oil down slightly, giving you the opportunity to fry the garlic without burning it and releasing their aroma. – As soon as the garlic enters the wok and you have given it one good stir, it’s time to add the snow peas. – Toss all the ingredients around in the wok and add the oyster sauce. You will know when the snow peas are cooked when they go from a muted to vibrant green. Be sure not to overcook snow peas however – as they are also eaten raw, any overcooking will make them soft and no long crisp. – Pour out your dish and eat. That’s probably the best part.